The American Human: Keep Our Safety Net. In Fact, Expand It. 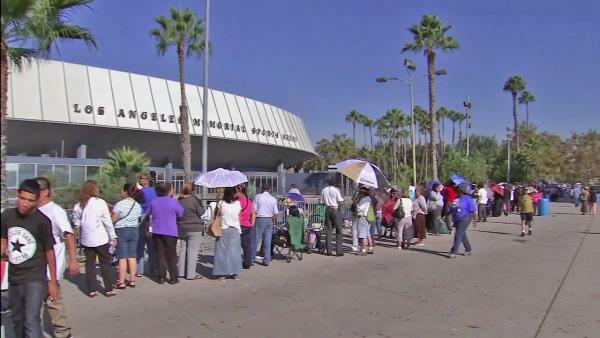 Free healthcare clinic at the LA Sports Arena last weekend. This is a safety net? Contrary to what Marcus and the Serious People want people to believe, there is no spending problem, there is a problem of out of control health care costs. The United States pays more than twice as much per person for its health care as the average for people in other wealthy countries, with little to show in the way of health outcomes. If we paid the same amount as any other wealthy country we would be looking at huge budget surpluses, not deficits. Almost 5000 lined up on a Monday to get wristbands to get in the Arena on Saturday. The Y axis shows the healthy outcomes and the X axis shows the cost. The size of the bubble shows the total amount of the costs per capita that come from the private sector. All of western Europe does a better job at a lesser cost than the U.S. does. The bottom line on healthcare is go Medicare for all, full stop. How to pay for it? Raise taxes, mostly on those who can afford it. And because we then can lower costs overall, our budget woes begin to get solved. It's also fine to raise the Medicare taxes a bit, too. It'll more than come out in the wash. While we're at it, mandate that the money businesses and governments save on employer-provided healthcare goes straight to the workers. And, hey, Republicans, that way the money employers used to spend on healthcare becomes income, and can then be taxed, like some of you, like John McCain, and yes, Simpson Bowles, wanted to do. And we fix the declining incomes of the middle class, and, while we're at it, chip away a bit at income inequality. What's not to like? Also, a healthier America is a more productive America, and, fat-cat job creators, that means more profits. I'm not kidding, it's the way it works. How would it work? Check out here, here, here, and here. More on Social Security later. So reducing the budget deficit just isn’t the top priority for America at Buy Viagra Online the moment; creating jobs is. For now, the administration’s political capital should be devoted to passing something like last year’s American Jobs Act and providing effective mortgage debt relief. Any charat that shows the United Kingdom's health care as effective and effecient is both idiotic and hilarious.